Michelle Rozzen > Massage Diaries Blog > Massage > Entrepreneur of the Week! The past two weeks have been amazing and I have so much to share with you all, new blog post coming soon! 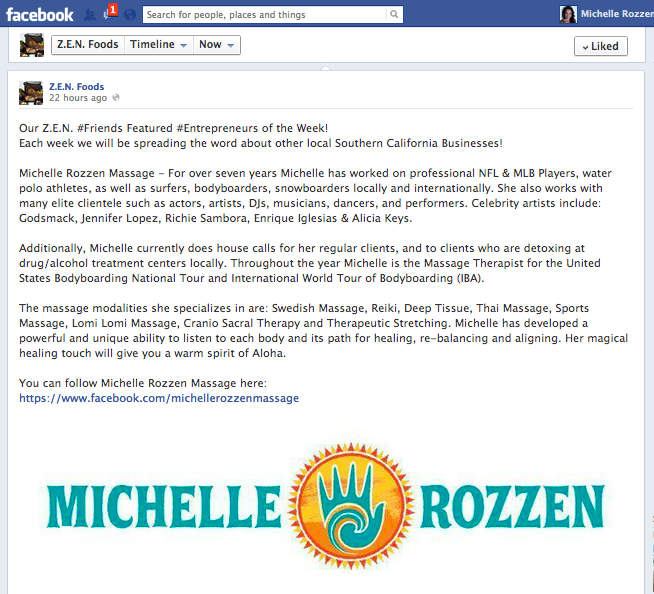 Today I was recognized by Zen Foods for being “Friends Featured Entrepreneur of the Week!” Go check out Z.E.N. Foods Zero Effort Nutrition, a delivery service for healthy foods and juices in the Los Angeles and Southern California area. If your company is interested in hiring a me as a massage therapist for special events in your store, office, or on tour, please contact me.